Scheila (minor planet designation: 596 Scheila) is a main-belt asteroid and main-belt comet orbiting the Sun. It was discovered on 21 February 1906 by August Kopff from Heidelberg. Kopff named the asteroid after a female English student with whom he was acquainted. 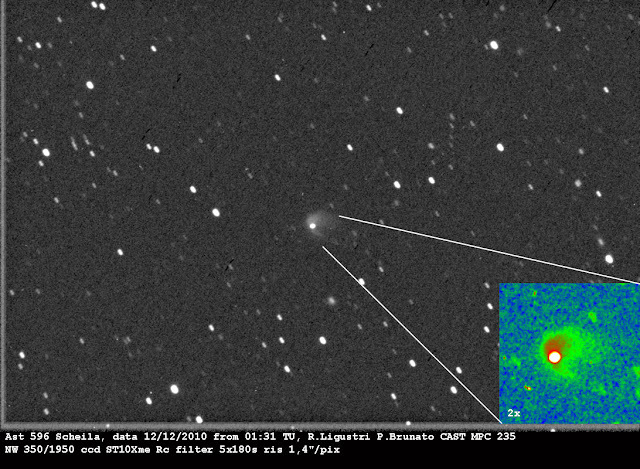 On December 11.4 2010, Steve Larson of the Catalina Sky Survey detected a comet-like appearance to asteroid Scheila: it displayed a "coma" of about magnitude 13.5. Inspection of archival Catalina Sky Survey observations showed the activity was triggered between 2010 November 11 and December 3. Imaging with the 2-meter Faulkes Telescope North revealed a linear tail in the anti-sunward direction and an orbital tail, indicative of larger slower particles. When first detected it was unknown what drove the ejecta plumes. Scheila's gravity is too large for electrostatics to launch dust. Cometary outgassing could not be ruled out until detailed spectroscopic observations indicated the absence of gas in Scheila's plumes. Observations by the Hubble Space Telescope and the Swift Gamma Ray Burst Mission's UV-optical telescope make it most likely that Scheila was impacted at ~5 km/s by a previously unknown asteroid ~35 meters in diameter. In 2010, the Hubble Space Telescope observed the aftermath of a catastrophic collision that destroyed[dubious – discuss] the much smaller asteroid P/2010 A2. Each asteroid the size of Scheila might be hit by an impactor 10–100 meters in diameter approximately every 1000 years, so with 200 asteroids of this size or bigger in the asteroid belt, we can observe a collision as often as every 5 years. Scheila last came to perihelion on 2012 May 19. ^ a b c d e f g h i j k "JPL Small-Body Database Browser: 596 Scheila (1906 UA)" (2010-11-14 last obs). Retrieved 7 May 2016. ^ a b c David C. Jewitt. "Main Belt Comets". UCLA, Department of Earth and Space Sciences. Retrieved 2010-12-15. ^ a b c Jewitt, David; Weaver, H.; Mutcher, M.; Larson, S.; Agarwal, J. (2011). "Hubble Space Telescope Observations of Main Belt Comet (596) Scheila". Astrophysical Journal Letters. 733: L4. arXiv:1103.5456. Bibcode:2011ApJ...733L...4J. doi:10.1088/2041-8205/733/1/l4. ^ a b c d e Bodewits, Dennis; Kelley, M. S.; Li, J. -Y.; Landsman, W. B.; Besse, S.; A'Hearn, M. F. (2011). "Collisional Excavation of Asteroid (596) Scheila". Astrophysical Journal Letters. 733: L3. arXiv:1104.5227. Bibcode:2011ApJ...733L...3B. doi:10.1088/2041-8205/733/1/L3. ^ Schmadel, Lutz D. (2003). Dictionary of Minor Planet Names. Springer Science & Business Media. p. 61. ISBN 978-3-540-00238-3. ^ Ernesto Guido & Giovanni Sostero (2010-12-12). "Comet-like appearance of (596) Scheila". Remanzacco Observatory in Italy (blog). Archived from the original on 7 January 2011. Retrieved 2010-12-12. ^ Mike Simonsen (2010-12-12). "A Comet Masquerading as an Asteroid". Simostronomy (blog). Retrieved 2010-12-12. This page was last edited on 8 February 2019, at 12:30 (UTC).